Effective sales copy on a website shouldn’t suggest that the reader take some specific action, but demand the customer take a specific action immediately. 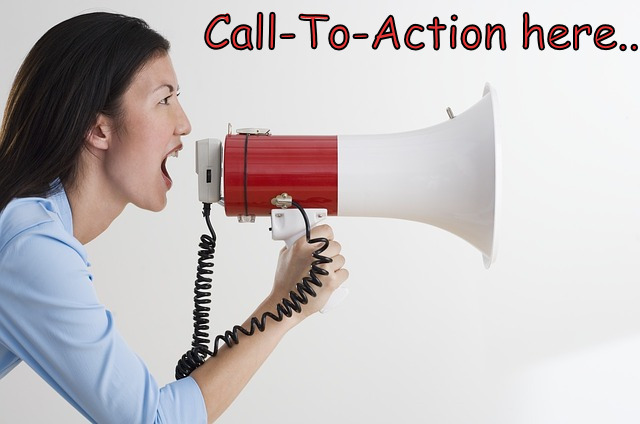 This is known as the call to action (CTA) and it is the most important part of any type of sales copy. Everything preceding the CTA should be pushing the customer into taking the definitive action you want them to take: namely, to purchase your product, subscribe to your service, click on a link, etc. Rule 1: The CTA must be very direct and very clear. There can be no ambiguity as to how you want your prospective customers to act. It is a critical point in the flow of your sales letter. You risk losing your customer forever if there is anything confusing or not crystal clear in your CTA. In your CTA, you don’t want to ask your customers to buy your product. You want to demand that they buy your product by presenting it as the only possible solution to whatever product they are experiencing. What comes before in your sales copy simply sets up the problem. Introduce your product as the solution and explain the benefits they will receive if they purchase your product. You should also offer social proof that explains how your product has already improved the lives of others or received the endorsement of authoritative people. You also can offer bonuses to add value to your offer and provide an unconditional guarantee. There should be no other course of action for them but to buy your product when you follow this structure. When you want to insert your CTA, that’s often the phrase “So what are you waiting for? !” is used right before the CTA. This is often the final push your prospective customers need to act on your clearly-defined CTA: To click on the link to buy your product NOW! People prefer things that are familiar to them, so your sales copy should be immediately identifiable as sales copy. Avoid using unusual or strange formatting that your readers may find off-putting. To get an idea of what your web copy should look like, visit the sales pages of your competitors and see what they are doing. Use standard, neutral colors and familiar fonts on your web pages so that you don’t alienate your visitors. Remember, when they arrive on your page, they are not yet familiar with your product. Do whatever you can to set them at ease. If you choose to use a video sales letter or include a short video on your sales page, write a script that includes all the key elements of your sales letter because the sales techniques are the same for video as they are for text. If your CTA is forceful and clear, your pricing provides a lot of perceived value and is neither excessively higher or lower than your competitors, and you have engaged your reader on an emotional level to prove that your product is something they can’t live without, then your sales letter will convert well. It is a critical point in the flow of your sales letter. People prefer things that are familiar to them, so your sales copy should be immediately identifiable as sales copy. To get an idea of what your web copy should look like, visit the sales pages of your competitors and see what they are doing. Another option is to run a Google search on high-converting sales pages and then “borrow” the formatting of those pages for your own. Video sales letters are another option for you to consider.